I know the saying “Nothing tastes as good as thin feels” but I’m pretty sure thin doesn’t taste as good as some loaded nachos. 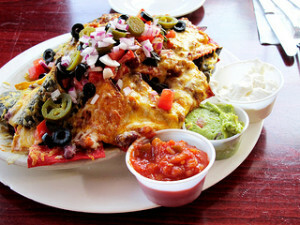 I not only want nachos, I want the nachos in that picture! I KNOW! Isn’t that picture both temptation and torture at the same time? Crap, now I want nachos too! I’m not a greedy dude but I also want those nachos in the picture and I’ll fight both you and Mario for them! You speak the truth, oh great Guru! When it comes to food, I’m pretty much an expert. I really am. I really, really am. I love nachos! That is all I can say here! So do I! I totally wanted nachos after I posted that picture!